Don't let baby-wearing intimidate you! With just a little practice, you'll be amazed at how quickly these awesome carries become second-nature! Print or read the text instructions and click the pictures to enlarge. 1-7: Tie your meh dai (mei tai) comfortably around your waist using a square knot. 8-10: Center your baby in the meh dai (mei tai) body, and lift the meh dai up between baby’s legs. Always keep at least one hand on your baby, or hold baby securely using straps. Practice over a soft surface such as a mattress, and use a mirror or other reflective surface to check your work. You can also enlist the help of a trustworthy spotter. 11-13: Flip the straps over your shoulders, and cross them in an X on your back, taking care to not twist them. 14-16: Arrange the shoulder pads to your liking, and spread the straps wide across baby’s bottom as shown. 17-19: Pass straps underneath baby’s knees, and tie in a knot. 20: Baby should be high on your chest, not low on your belly. There should be no loose space between you and baby–the carrier should be bandage tight and very supportive. Baby’s face should be visible, her head close enough to kiss, with clear airways. If baby can sit unassisted, he may be ready for a back carry. 1-6: Tie on carrier just below bust line, at waist, or on hips depending on age of baby or your particular physical preferences. 7-9: Lift baby onto your back, positioned squarely. 10: Lift the body fabric between baby’s legs, all the while keeping a secure hand on baby. Tie on your baby over a soft surface such as a mattress, and use a mirror or other reflective surface to check your work. You can also enlist the help of a trustworthy spotter. 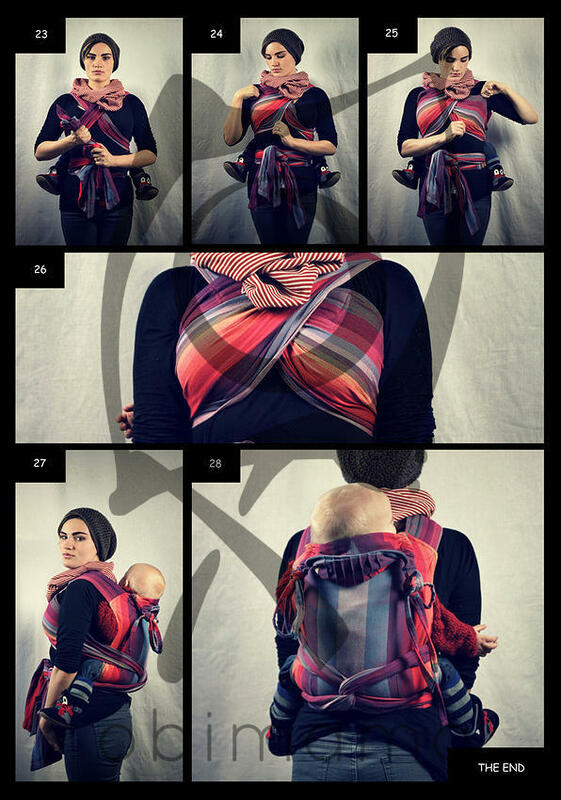 11-12: Holding both straps, carefully bounce baby down into the carrier. Baby will be seated fully in the body of the carrier, with no bunching fabric. 13-14: Pin one strap between your legs while you arrange the other strap. 15-22: Pass the straps across baby’s bottom in an X, creating a wide, supportive seat. You should be able to feel baby’s breath on your neck. 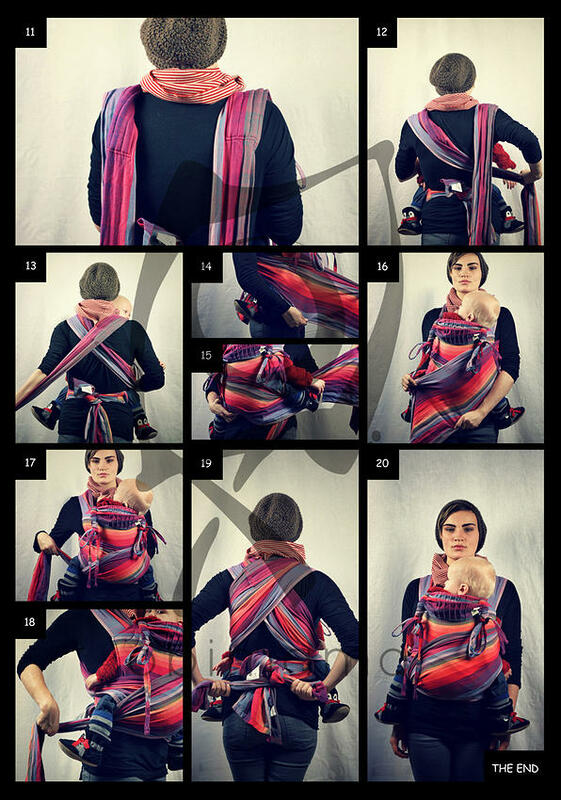 23-27: To create a Tibetan chest strap, crisscross the tails of the shoulder straps, passing them underneath the opposite strap at armpit level. 28-30: Tie in a square knot. 31-34: Spread the passes across your chest for greater comfort. 8-10: Center your baby in the meh dai (mei tai) body, and lift the meh dai up between baby’s legs. Make sure that your carrier is fitted to your torso snugly. 11-12 : Flip the straps over your shoulders, taking care to not let them get twisted or bunchy. The wider your straps are, the more comfortable you will be. 13-16: Cross the straps on your back, then bring them to the front and cross them over baby’s bottom (not baby’s sensitive spine). 17-19: Twist the straps, to form a seat. 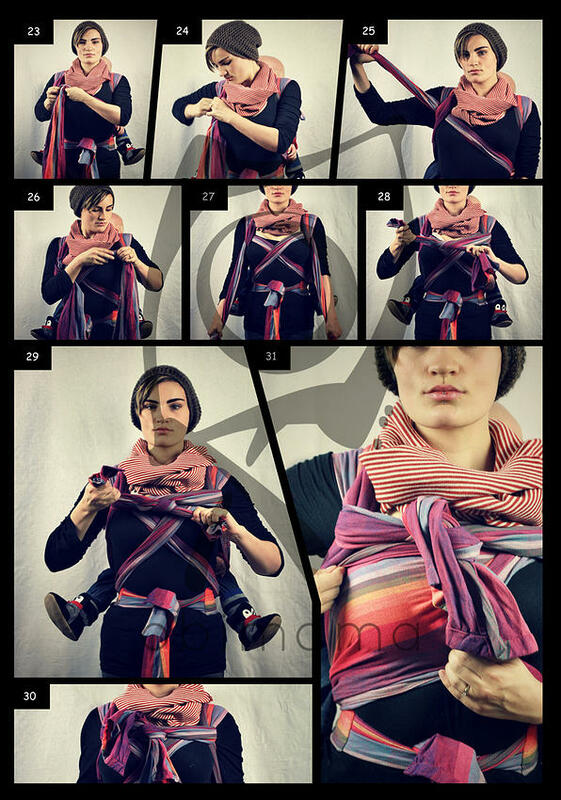 20-24: Pass the straps under baby’s knees, and tie off in a secure knot. Baby’s knees should always be higher than baby’s bottom. 1-6: Tie on carrier. You can tie the knot off to one side or centered. If baby is small but wishes to have a great view of the world, tie the waist up high on your torso. If you child is very large, long, and heavy, tie the carrier onto your hips so that your pelvis will bear some of the weight. 7-10 : Slide baby squarely onto your back Keeping your back tabletop flat, bring the body of the carrier up between baby’s legs. 23: A double knot is an acceptable option, but will not lie as flat as a square knot. If you have excessively long tails you can tuck them under your waistband or tie a bow. 24-28: Arrange the straps comfortably on your chest and shoulders, and go!